The testing call is now closed. Thank you so much for your support! The Bonn Shirt & Dress is now available in the shop. Hi my lovely friends! I feel that I blink and the summer is slowly leaving us behind, at least for those of us who are in North America. 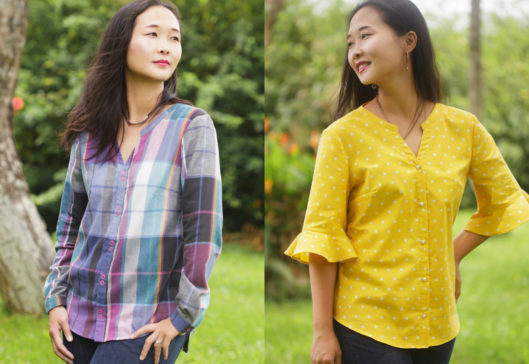 Many of you are already in full-fledged fall sewing mode? So I think a shirt with sleeves is in order. And while at it, why not also make it a shirt dress too? Are you interested in helping me test this sewing pattern, Bonn Shirt & Dress? Bonn comes in A, B, C, D and DD cups. It has two length options – one shirt length and one dress length. It also has four sleeve options – from short to long sleeve, as well as 3/4 sleeve and a flare sleeve for a romantic touch. It has V neck, but it also has a non-traditional mandarin-like collar. This collar is not a stand-up collar; it actually lays flat against the body. It’s OK to use different sizes for the bust, waist and hip. All you have to do is print the sizes that you need, and blend the lines from one size to the next. I plan to start testing Friday, August 26th, and would like to receive your modeled photos with your garments by Saturday, September 3rd. But as always, if there’s any important change to the pattern, we’ll extend testing as needed. Please only apply if you are interested in the style of the pattern. The waist of this shirt is not fitted. If you like your garment very fitted, please forgo this testing call and wait for the next style that interests you. You are expected to choose a size based on your body measurements and sew the pattern as written for the purpose of testing. Thank you ladies. The testing call is over. You can watch out for testing calls on Itch to Stitch’s Facebook group (https://www.facebook.com/groups/ItchToStitchDesigns/) or subscribe to the blog using Bloglovin’ (https://www.bloglovin.com/blogs/itch-to-stitch-12911671). Thanks for your interest! Looks like the call for testers is over, but if you need more testers I’d love to be involved! I love the simple look of this pattern and could see it becoming a wardrobe staple. If you are still looking for testers I’d love to do it. I just recently tested the Winslow culottes pattern and found it to be a really rewarding experience. I would love to test your pattern. I just recently tested the Winslow culottes pattern which I found to be a really rewarding experience. Love all the sleeve options! If too many testers want to do the bell sleeves I could make the Three quarter sleeves instead. Or even the Short sleeves. What ever you need for variety.? Hi Kennis, I would love to test this pattern! For the dress , size 14, love the sleeves! love the style and those sleeves, I am size 22/24 so too big. perhaps next time. Kennis, loving this one!!!! And the shirt dress? LOVE!